A big story on Twitter this weekend, which then made its way into the press--Spanish-language at least, as I haven't yet seen mention in English-language MSM--was the Twitter war between Nicolás Maduro and Alvaro Uribe. They hate each other, and made that very clear. Twitter should soon get into IR research. Bear with me, I'm not joking. What I wondered--let's call it "hypothesized" to make it sound better--is that dialogue on Twitter is a way for leaders (and in this case an influential ex-leader) to express raw views without the same backlash as a formal media event. We see it on Twitter and chuckle (or get annoyed, depending on your views) but it stays low level. A counterargument is that Maduro for sure, and probably Uribe these days too, makes plenty of aggressive arguments in formal settings that don't get taken all that seriously. But still, Twitter seems to be perceived differently. It's not "leaders are arguing" but rather "leaders are tweeting at each other." Twitter is not used uniformly by Latin American presidents, and in some cases not at all. But those that do are communicating in new and creative ways, 140 characters at a time. I am way behind in mentioning Michelle Bachelet's grand re-entry both into Chile and into Chilean politics. Maybe because I can't help but find it a bit distasteful, this image of her returning for the good of the people. It's a veritable Chilean political Easter! I like Bachelet, so I'm not sure why my immediate reaction has been quite so negative. I will be curious to see how my views change over the course of the year. She has a very good chance of winning the presidential election in November, but there is an equally good chance that she'll generate impossibly high expectations. Politically, she has nowhere to go but down. She left office with an amazingly high approval rating and it is hard to imagine keeping it there. She will represent a coalition that has yet to reinvent or reimagine itself after its defeat. It is also a coalition with leaders not terribly happy about the fact that she hamstrung potential presidential candidates by remaining cagey about her future plans until the last minute. Robert Funk talks about some of her challenges. There are quite a few. But advocates such as Jess George, executive director of Latin American Coalition in Charlotte, sees the move as a contradiction to national efforts by the Republican Party to appear more welcoming to Latinos. Those efforts include officially supporting calls to legalize the nation’s 11 million illegal immigrants. The governor appears to be intentionally tone deaf when it comes to Latinos. This comes on the heels of taking a while to back off the pink licenses for undocumented immigrants whose deportation was deferred under the new federal program. It was hard to see the original proposal as anything but vindictive. As Charlotte's mayor, McCrory was commonly viewed as moderate, but has veered sharply to the right (see my last post on higher education). From an electoral perspective, as I've written many times, Latinos in North Carolina represent only a tiny fraction. So it is politically safe for McCrory to do this. But it will hurt the Republican Party a lot in the long run, since the Latino population has been growing so much and before long will be a nontrivial chunk of the electorate. 3. Say we need to "engage"
Some of that is in Peter Hakim's op-ed at Reuters but he adds a good conclusion that moves away from platitudes and gets to important things like incentives. From a policy perspective, this gets to the heart of things. It's not that we should change policy to achieve some vague ideal of "engagement" or to do the right thing. We need change because it will alter the incentives of Latin American leaders. We need it because our current policy hurts us more than anyone else. The Council on Foreign Relations has a short (8 minutes) video on Mexico and drugs. It is a solid overview of the situation and the challenges the country faces, along with a discussion of some of the more positive developments over the past twenty years (e.g. democratization). One thing I found missing, though, is the question of why Mexico is facing this situation at all. The video is titled "Mexico's Drug War" and although the second half of the video brings up U.S. policy options, it does not mention how in many ways this is the U.S. drug war brought to Mexico. I was pleased to see that my article "Immigration and Transnationalism: Rethinking the Role of the State in Latin America" was just published in "early view" form in International Migration. However, that article was a lesson in the difficulties of traditional journal publishing. You see, after a revise & resubmit, the final version of the article was accepted on October 23, 2009. That was 3.5 years ago. I am thankful that the topic was not terribly time sensitive. I don't want to come down too hard on the journal, because I am well aware of the things that can delay publication (and I'm sure I've had authors annoyed at me) but this many years is over the top. It's about as inefficient a way you can possibly find for diffusion of ideas. I read Francisco Toro and Juan Cristobal Nagel's Blogging the Revolution, a book comprised of posts from their very well-known opposition Caracas Chronicles blog*. They started the blog in 2002 so there was plenty of material to choose from. First, Hugo Chávez's political use of oil revenue represents strong continuity with the past, even if the recipients are different. One of the nice things about the blog is the keen sense of history. Toro and Nagel really dislike Chávez, but they don't sugarcoat the past. You read about historians, novels, and all sorts of people the authors interview, both formally and informally. Even if you disagree with the posts, they are generally very thoughtful. The authors also don't tend to offer much hope that the opposition would do any better if it took power. They periodically come back to the question of how Venezuela can break out of it. Second, past leaders were corrupt, but Chávez takes it to a new level. The corruption is supported by many anecdotes, though with less of the historical comparison (how much did the dominant parties shake people down for political support or money in the past?). From the neighborhood level to the top echelons of government, corruption abounds. Demonstrating that it is worse, however, doesn't always come out. Could it be that corruption also represents continuity? Third, the country is moving toward authoritarianism. This tends to veer around, and the lack of chronological order of the posts exacerbates it. There are discussions about how totalitarianism is a totally inappropriate term, then later "we really do have all the characteristics of leftist totalitarian communications here" (electronic page 142). But there is a lot of interesting discussion about the disjuncture between the precise wording of the Venezuelan constitution and the way politics actually works. I like the idea of taking a blog and trying to contextualize it. If a few people write for years, they do develop certain ideas and themes that persist, and they help orient unfamiliar readers. If the blog is, and this one is, then it's worth the read. * FWIW, I was given an ebook version for free. First two installments are here and here. What we're hearing a lot is "efficiency." The governor wants universities to be run more efficiently and be more accountable. This means evaluation. This is a perfectly reasonable idea, but very few people see how all too often it is operationalized on the ground level, namely in individual departments. As department chair, I receive instructions on evaluation and assessment and I have to carry them out. There is an enormous gap between the governor or state legislator and me. They make a speech about efficiency and have no idea whatsoever how it is measured. No matter how lofty it sounds at the beginning, evaluating academia at the ground level means a tremendous amount of paperwork, more bureaucratic rules, and new administrators to watch over it all. We do a ton of it now. We come up with new measures, forms, tables, matrices, student learning outcomes (SLOs), target percentages, and test questions. The culmination of this process is the spitting out of numbers, and then we are judged by those numbers. We are already doing plenty of this for accreditation from the Southern Association of Colleges and Schools (SACS). It is very time consuming, so if the legislature adds more, we will be spending quite a lot of time with paperwork. Staff time will have to be sucked up even more to collate everything into one big fat report. Professors are considered easy targets since lots of people believe we waltz in, teach, and then nap all afternoon. What people don't realize is that--in addition to many other things--lots of professors have to spend quite a bit of time doing this. Evaluation gets integrated into classes, requires countless meetings, and faculty must collect data. So, taxpayers and students, watch out for a plan that involves spending money on more evaluation in the name of efficiency and accountability, which means funding the creation of new bureaucrats (and yes, the governor's budget proposal does include that spending even as it cuts elsewhere). It also necessarily means less money for instruction. That means not hiring new tenure track faculty and relying ever more on part-time instructors. It means your professors will also spend more of their time on paperwork rather than classes. Part I is here. Today I want to note the concrete effects of budget cuts. Governor McCrory's budget proposal calls for cuts totaling $135 million from the UNC system. Some of this--how much is open to debate--will be offset by charging out-of-state students more. But this constitutes a significant cut at a time when we've already suffered $1 billion in cuts over the past five years. These things do not add up to the quality education that Governor McCrory claims to value. At UNC Charlotte we're down faculty and have not been given the funds necessary to replace them. You can keep cutting in the name of market efficiency, but quality will suffer, and students will bear the brunt. Or McCrory and the legislature will simply go for the nuclear option, which is to dissolve one or two universities entirely. They're already talking about it. As governor, Pat McCrory will work with education and industry leaders to develop a comprehensive and innovative approach to measure program success rates and student job attainment. This approach must encompass both community colleges and universities, and draw on existing resources from North Carolina’s already substantial performance measurement systems to create a single, transparent operation. He has repeated something similar many times. What this means is that universities will be judged directly by jobs*. The essential problem here is that this is not a trade school--our mission is to teach people how to think, write, etc. These are critical skills for a job, but most disciplines don't funnel you directly into a specific trade. What we know for sure is that a college education is highly advantageous both for employment and wages. From my own perch, UNC Charlotte is a school where many students are the first in their family to attend college, are not that well off, and are often transfer students who only have a short time with us. We need to give them as many skills as we can to succeed as engaged citizens--above and beyond just getting a job--but there is no way we can compete with schools that don't share the same challenges we do. We are giving our students a big advantage they would not have otherwise, but we're not magical job makers. We will therefore be punished for something beyond our control. Our mission is to advance the discovery, dissemination, and application of knowledge in the traditional areas of liberal arts and sciences and in emerging areas of study. Our world-class faculty aspire to be thought leaders -- passionate about their teaching and scholarship -- who model ethical and engaged citizenship for their students. Our faculty and students actively engage with local, national, and global communities and seek to transform the world through creative and innovative solutions. * I won't even get into the mess of the money, paperwork and bureaucracy required to create and maintain a database of student job outcomes for the entire UNC system. Omar Encarnación has an article in Foreign Affairs on the decline of Catholicism in Latin America. Some of it is a bit overdone, since I am not sure that Latin Americans view the new Pope warily just because he is Argentine. Beyond Bergolgio’s personal baggage, there are other reasons to doubt whether he will be able to revive Catholicism in Latin America. Although Catholics in the United States and Western Europe Catholics are leaving the church atop a tide of secularism, in Latin America, Catholics are leaving because they find other religious options more appealing. The decline of Catholicism in Latin America has been met with an explosion in Protestantism. It is estimated that approximately 15 percent of all Latin Americans are Protestant -- a startling figure considering that, as recently as the mid-1990s, only about four percent were Protestant. The most “extreme” case is Guatemala, where approximately 30 percent of the population is Protestant and three presidents have identified as Evangelical. In Brazil, an estimated 500,000 people are thought to be leaving the Catholic Church per year, with the bulk of them converting to Protestantism. Those flocking to the Evangelical mega-churches of Rio de Janeiro cite the Catholic Church’s authoritarianism and strict hierarchy -- embodied, curiously enough, in the pope -- as the primary reason for leaving. By contrast, they point to the opportunities that Protestant churches afford for women and minorities to ascend the ranks. In addition, they appreciate the positive message of self-empowerment and teachings on how to accrue wealth and prosperity. It is hard to imagine that Bergoglio’s message and example of humility and frugality, however virtuous, will resonate with these folks. Interesting cultural question, though I think Catholics can still happily get rich while liking Pope Francis, just as they've passed liberal laws about a host of different issues. The overall point about not losing ground to other religions, however, is a good one, especially since it is clearly a reason for choosing him in the first place. Frances Hapogian basically agreed in a New York Times piece. Latin America is increasingly more politically and religiously plural. Catholicism has to compete. Via Manuel Rueda on Twitter (@ruedareport) I found Maduro Dice (Maduro Says). It claims to catalog every time Nicolás Maduro has mentioned Hugo Chávez since the latter died (or, as the site says, "since the announcement of his physical disappearance). It is updated frequently, with funny commentary. As I write, it says 3,195. For whatever reasons, Hugo Chávez has generated some of the funniest Spanish-language stuff there is. Just read El Chigüire Bipolar. It is all absurdist, like The Onion in the sense of showing how absurd reality is such that you can barely tell them apart. So did Maduro really refer to Chávez 3,195 times by now? The point is that it doesn't matter. He did so in a hat, without a hat, in a box, with a fox, in a house, with a mouse...well, you get the idea. The point is the obvious absurdity of the constant mentions, which is going viral and becoming comedy gold. Very interesting study commissioned by the Igarapé Institute (in Brazil) and the University of San Diego's Transborder Institute: The Way of the Gun: Estimating Firearm Traffic Across the U.S.-Mexico Border. We tackle the challenge of estimating arms trafficking from the U.S. to Mexico differently. We apply a unique GIS-generated county-level panel dataset (1993-1999 and 2010-2012) of Federal Firearms Licenses to sell small arms (FFLs), we create a demand curve for firearms based on the distance by road from the nearest point on the U.S.-Mexico border and official border crossing. We use a time-series negative binomial model paired with a post-estimation population attributable fraction (PAF) estimator. We do so controlling for determinants of domestic demand (e.g., income, political leaning, population density, and spatial auto-correlation). We are able to estimate a total demand for trafficking, both in terms of firearms and dollar sales for the firearms industry. The U.S. and Mexican authorities are seizing a comparatively small number of firearms at the border: Based on seizure reports for 2009, U.S. and Mexico authorities in recent years have been seizing just 14.7% (between 8.7% and 35.0%) of total arms bought with the intention of trafficking them. Specifically, Mexican authorities have seized roughly 12.7% of the total annual trade whilst the United States has intercepted around 2.0%. Not a fun read, but a necessary one. One serious obstacle is that control of guns in the United States is viewed entirely as a domestic issue, whereas (like immigration) it really is also foreign policy. As the report points out, Mexico has few guns and has tight regulations, so lax laws on the other side of the border carry considerable international consequences. The United States needs to share responsibility for the problem of gun violence in Mexico. Well worth a few minutes of your time to read. Staying classy until the very end, former dictator and frequent jailbird Jorge Videla has called for the Argentine military to rise up and overthrow the government. This is someone who overthrew the government, ordered the use of extraordinarily repressive means to maintain political control, helped with the theft of babies, oversaw the unraveling of the Argentine economy, and contributed to the almost total de-legitimization (and de-funding) of the Argentina military. Despite that, I guess he figures his opinion matters within the ranks. It is also a reminder that the age-old habit of calling the military to cut resolve political conflict is very hard to stamp out. However, it is also reasonable to assume that this particular convicted criminal's views aren't widely shared. Or at least we can only hope. Nicolás Maduro just started a Twitter account (@NicolasMaduro), where he describes himself as a (the?) "son of Chávez." The obvious and intended comparison is Jesus Christ, but there are other--and much less pleasant--possible comparisons. For example, is Maduro like the seed of Chucky? Not so pleasant. Or maybe the son of Sam? Equally unpleasant. A more optimistic comparison would be Sanford and Son, because you know Lamont would run things better than Fred. Maduro seems intent on criticizing heretics. For the country, he'd be better off trying the Lamont model. Or even better, don't say you're the son of a dead president for political gain. Like so many other people, I was annoyed when I learned that Google Reader was disappearing in July. I'm actually not a devotee per se, but I just don't want to spend time searching for and switching to something different. I decided on Feedly, primarily because it allows you to quickly and seamlessly move all your Google Reader feeds. So far, it is working really well and I don't miss Google Reader. It is very easy to organize and access all your feeds, and on an iPad it has very intuitive features. My only complaint is that it seems to take too many steps to copy a link--I wish you could quickly open it in Safari. Maybe I am just missing something. Update: I WAS missing something. There is a circle icon at the top right of the page that immediately opens the blog post (or whatever it is) in Safari. Another issue is that for years I've been sharing blog posts I like, which then show up on my blog, and Feedly does not have the same feature. However, increasingly Twitter is serving that purpose for me, and since my tweets also show up on my blog, sharing is actually just duplication. In short, you can give it a test drive with minimal waste of time and effort. Just do so before July 1. What is lost by both sides when they resort to conspiracy theories is politics: the forthright recognition of differing views and interests, negotiation with foes, and the attempt to convince voters on the issues. Sound familiar? It's just like the United States, where it predominates with the right. Instead of grappling with complex policy issues, just say Barack Obama is a Kenyan Communist trying to establish a dictatorship (with lots of "what the media doesn't want you to know" sorts of statements). I mean, we even coined a new term, "birthers," that refers to crazy people. I expect some similar word to pop up in Venezuela for those who believe that Hugo Chávez's cancer was cooked up in a CIA lab. I won't belabor the many accounts of the new pope's actions (or inactions) during the Dirty War in Argentina. The New York Times has the basic overview. In the absence of hard evidence showing complicity, this won't matter much. Of course, I don't mean the accusations don't matter, or that the victims don't matter. But it is hard to see this affecting his new role. Latin Americans are excited about having a pope--even the late Hugo Chávez apparently!--and that's what the average person is thinking about. He's one of us. He rides the subway. I imagine reporters and researchers are heading to Buenos Aires right now, looking to dig. If they find something concrete, it'll make serious waves. If they don't, then this will likely fade to the background, never going away but at the same time not hovering over him. Even Cristina Fernández de Kirchner was more irked by his social conservatism than by his past. And even she congratulated him. 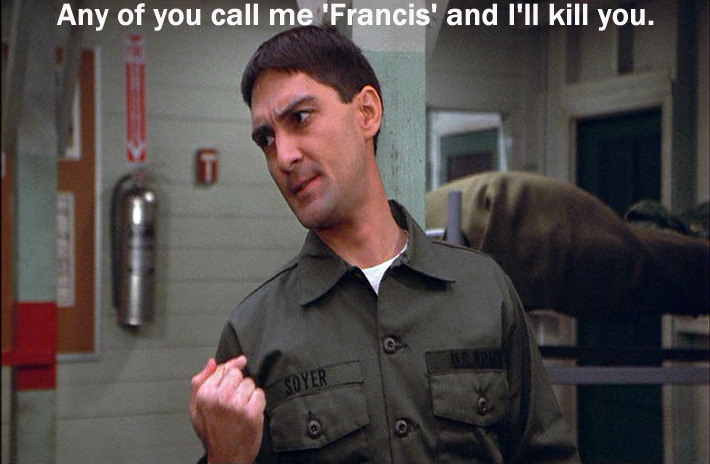 And remember, if you call him Francis, he'll kill ya. Via Just the Facts, here is the Senate Select Committee on Intelligence's "Worldwide Threat Assessment of the U.S. Intelligence Community. For Latin America there is mention of Iran but not in too sensational a way. Iran is not mentioned with regard to Venezuela, which in fact gets pretty bland treatment. Venezuelan President Hugo Chavez’s death on 5 March has triggered preparations for a new election in which we expect Vice President Nicolas Maduro to compete against Miranda Governor and former presidential candidate Henrique Capriles Radonski. Venezuelan Foreign Minister Elias Jaua announced that Maduro will take over as interim president and that an election will be held within 30 days. Maduro is a long-time Chavez loyalist and will almost certainly continue Chavez’s socialist policies. This could have been culled from recent media reports in less than five minutes. However, bland and obvious is far better than paranoid and deranged. I read Ken Follett's brick of a book, Fall of Giants. It's the first part of a huge trilogy about the 20th century, and focuses on World War I. I enjoyed it. It's a soap opera with really intelligent commentary on the class divides that were rigid but changed as a result of the war. You've got the Welsh miners and the Welsh earl (married to Russian nobility), members of the German elite, the lower strata of Russian society, American political elites, British radicals, and others in a sprawling story. They intersect in ways that strain credulity--too many people see each other coincidentally, even on a French battlefield--but it works. It's a beach book with a backbone. Someone with no historical knowledge would at least get a sense of the ridiculous and sad chain of events that led to the war, the reasons it went on so long, and then get a taste of the consequences. 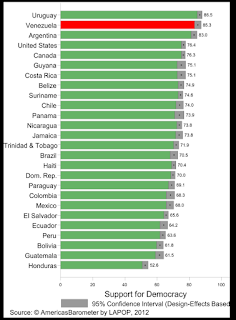 The Latin American Public Opinion Project has some data on support for democracy in Venezuela. The upshot is that it is high, and in fact even higher than in the United States. We have to be careful about how we interpret this. It does not necessarily say that Venezuelans believe the country is being governed democratically. I expect many, particularly in the opposition, would say they believe in democracy, but not the way Hugo Chávez has managed it. On the other hand, it is undeniable that many Venezuelans do believe the country is being governed democratically. Either way, the overall level of support is important as Venezuela moves into unknown political territory. At the very least, leaders on both sides will feel more domestic pressure to find democratic solutions to political disputes. With luck the United States will recognize this and resist calls for intervention. Beyond generic calls for all sides, the U.S. should stay out. After a brief hesitation, Henrique Capriles has agreed to be the opposition candidate for the April 14 president election. Lots of combat-oriented rhetoric is flying all over, with "fight," "war," etc. Twitter is positively aflame with it. Capriles will almost certainly lose, which would put him in the very unusual position of losing two presidential elections in six months. There is, however, plenty of precedent for perennial losers eventually coming back. Salvador Allende first ran for president in 1952 and won only just over 5 percent of the vote, and didn't end up winning until 1970. In the United States, Richard Nixon is of course the most famous/infamous case, as he lost both the 1960 presidential election and then the 1962 California gubernatorial election, finally coming back in 1968. I saw the Panama Canal yesterday. So impressive. The lock doors are still original. What also hit home was how big the canal zone is. It was much easier to internalize how resentful Panamanians were about being excluded from this huge chunk of prime Panamanian real estate. There was just an enormous American bubble. The canal museum in the old part of town hammered home the problems with the 1903 treaty. My first thought was debt, which may well be the result. Somone has to be paying for all this. With Chávez around, these parties had achieved an organizational and institutional unity that might have been sufficient to topple him at the polling booth. Now it is likely that ideological differences, personal ambitions, and unsavory links with the past will become manifest, chipping away at the unity that had made Capriles an attractive alternative for many Venezuelans. I agree that the opposition is united primarily against rather than for anything in particular. But the fact is that opposition groups have a strong incentive to remain united as long as they are out of power--it took them years to achieve it, and I don't see it disappearing that quickly. Whether or not the president is Chávez is immaterial. In fact, you could argue there is even more incentive without him because he seemed so invincible whereas Nicolás Maduro will be viewed as beatable in an election. Contrary to her argument, I think Maduro will have a much bigger challenge with coalition unity over the longer term than Henrique Capriles will, precisely because he is president. Maduro will enjoy a honeymoon period, but he hasa to hold together his own disparate factions. Chavismo is not a bloc. Rumors of someone's death must eventually be true. I'm not sure the last time a president's death mattered so much for the politics of a Latin American country (maybe Juan Perón?). According to the Venezuelan constitution, there will be an election in 30 days. That election will pit Henrique Capriles against Nicolás Maduro, and Maduro will have the very clear advantage. Chavismo is no bloc, however, and so assuming he wins Maduro will have to work hard to keep the coalition together. He will use foreign enemies as a foil as much as possible to generate unity, but will face internal political competition in a way that Chávez did not. I have a piece coming out in Americas Quarterly shortly arguing that ALBA will likely become less relevant as a result. Maduro will keep the close ties to Cuba, but he will also need to use resources for domestic constituencies more than Chávez did. I'm not sure what "psychological war" the government is referring to, unless they mean the rumor-fest that itself was caused by the government's refusal to give any facts about Chávez's condition. There's no "foreign laboratory" in that regard. And beyond a tiny minority of people like Roger Noriega, I don't see any appetite in the United States for "foreign intervention." Flavia Freidenberg and Andrés Malamud, "Politólogos on the Run: Contrasting Paths to Internationalization of Southern Cone Political Scientists." Latin American Politics & Society 55, 1 (Spring 2013): 1-21. Abstract (full text is gated). This is the sort of thing that deserves more attention, since political science (like many other disciplines) has long been dominated by the United States (and to a lesser extent Europe) but there is more and more cross-pollination. As the authors note, however, they chose their cases on the dependent variable--people who left--and so there is a lot left to explain. The vast majority of respondents are also Argentine, which leaves open the question about why people didn't leave other countries. I think of the Chilean case, where there are plenty of well known political scientists who received their Ph.D. abroad and then returned to become professors at various universities in Chile. 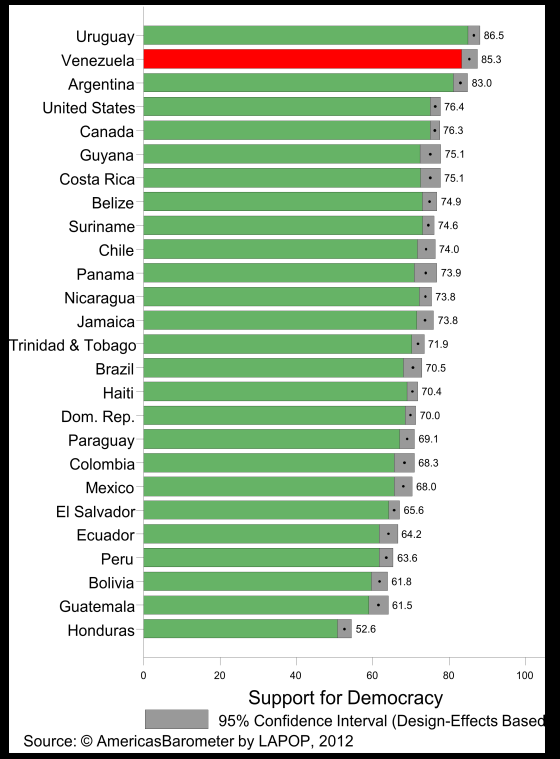 Overall, this type of study can fruitfully connect to the broader question of how much higher education is valued in each country. To what degree do governments value "brain gain"? Forget that it snowed a bit in the morning. By afternoon we got to see UNC Charlotte beat Youngstown State. One of the local curiosities is a guy who paces the concourse, often with baseball mitt all ready for a foul ball, calling out to the field and ending every sentence with a loud "UH-HUH!" So if the opposing pitcher throws a ball in the dirt, it's "Dirtball! UH-HUH!" or if an opposing batter watches a strike, it's "That's called taking a strike, UH-HUH! UH-HUH!" He even has signs, 10 or so in different scripts, all of which say "Uh-Huh." Later in the game he put on a "Uh-Huh" shirt and cap. We've seen him at Kannapolis Intimidators games too. It's just odd enough not to be annoying. He's obviously a very friendly guy, periodically chatting with people. I don't know whether he finishes every sentence with "Uh-Huh." I wrote a short piece at Foreign Policy on the ineffectiveness of election boycotts in Latin America. The basic idea is that they can very easily result in things you don't want.